"My heroes are no more neurotic than the audience. Unless you can feel that a hero is just as fucked up as you are, that you would make the same mistakes that he would make, you can have no satisfaction when he does commit a heroic act. Because then you can say, ‘Hell, I could have done that too.’ And that’s the obligation of the filmmaker — of the theater-worker — to give a heightened sense of experience to the people who pay to come see his work." 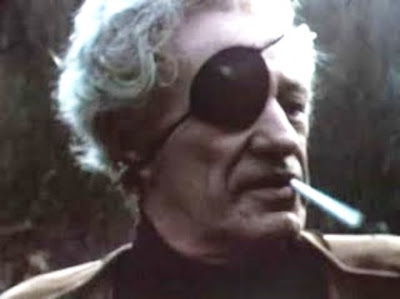 When I think of consistency in the cinema, Nicholas Ray is a name that always comes to mind. In fact, I struggle greatly finding a film of his that I really, truly dislike. Some of his later films were flawed, sure, but I've never had an unpleasant experience watching one of his movies. What I think of more than the man’s consistency, is how Ray always was a director ahead of his time creating the type of characters described in the quote above — characters that were flawed, misunderstood outcasts. It’s because of this that I’ve always been drawn to Ray’s films and continue to revisit them. What I remember most from his films was his propensity for making films about solitary social misfits. Whether it was Joan Crawford’s saloon owner in the brilliant Johnny Guitar (the film that acted as the catalyst for Godard’s remark that, “The cinema is Nicholas Ray.”), James Dean’s angsty teenage outsider in Rebel Without a Cause, or Bogey’s screenwriter from In a Lonely Place, Ray loved the theme of solitude and was better at it than perhaps any of his contemporaries. Like the quote above, Ray wasn’t interested in the status quo; he was a filmmaker who enjoyed existing in the margins, who wanted to push the viewer out of their comfort zone as it pertained to how they understood the role of the hero in film. He did the same for the actors with whom he worked. In almost all of his masterpieces (which pretty much encapsulates every film he made between 1949– 1958), Ray was able to exorcise whatever bad habits hammy actors had a tendency for in that era (just look at the differences between Dean’s performance in East of Eden versus Rebel) and elicited genuinely strong and poignant performances out of the most unlikely of actors; he definitely pulled what are arguably the best performances out of such screen icons as Humphrey Bogart (In a Lonely Place) and Robert Mitchum (The Lusty Men). It’s not just his themes or the fact that he could get a great performance from unexpected sources, but it was in the way that from that golden age of his career, he so rarely erred. An antagonist by nature, I can’t think of another filmmaker who has had that kind of run in Hollywood while simultaneously feeling so un-Hollywood; Ray was an iconoclast. He often used his films to explicate the kind of themes that not only interested him but were the kind of themes that allowed him to try and make sense of the chaos and isolation he felt in his own life as he often made films filled with themes and motifs that mirrored his bisexuality, marginalization, and increasing impatience from Hollywood producers. It is why, I think, he was able to elicit such great performances from his young actors — he connected with them. But Ray’s legacy rises above all of that to leave a lasting mark on cinema. I can think of only a handful of directors (Douglas Sirk, Alfred Hitchcock, Billy Wilder to name a few) that, for me, define the 1950s American cinema more than Nicholas Ray. John Houseman financed Ray’s first picture (after giving Ray a copy of the source material to read; the two fell in love with it) for RKO in 1947, They Live by Night, which wouldn’t be released until 1949. The story is as simple and cut-and-dried as a noir can be, and I mean that as a compliment. Ray, for a first time filmmaker, has incredible control of the film from beginning to end (he had complete creative control of the film). They Live by Night is an excellent precursor to Bonnie and Clyde — the kind of doomed-love-affair/bank heist picture that Arthur Penn popularized. From the opening tracking shot (shot from a helicopter) to the immediacy of a POV from inside a getaway car, Ray’s aesthetic for his debut film fits the noir genre perfectly. 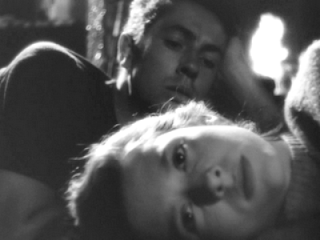 However, as is the case with most of Ray’s films, They Live by Night is not your usual noir crime story. At its heart is a story we would see fleshed out with Ray’s subsequent projects. The mismatched, doomed lovers who just don’t seem to fit in a way that society says two people in love should fit is nothing new to the genre; however, the film is filled with great, quiet moments (music and sound are used brilliantly throughout) between its two leads Farley Granger (Bowie, a bank robber who has just escaped from prison) and Catherine O’Donnell (Keechie, a gas station owner’s daughter) who give the film’s central (doomed) love story an added weight that a lot of noirs don’t slow down for. There’s a beautiful moment on their honeymoon (look and admire the way Ray lights the scene, incredible for a first time filmmaker) that showcases the deftness in which Ray handles young, idealized (and, again, doomed) love. The scene is when Keechie and Bowie are in a cabin talking about what they want to do in the future; it has a nice tinge of tragic irony as they try to fashion out a little domestic life for themselves on the run (they even go and get married on the cheap at a small chapel). Bowie has yet to see how the real world works as he’s still convinced that he and Keechie can escape and live happily ever after just as long as he can get enough money to get a lawyer to get him off the hook for a murder. What makes the scene so great is that it isn’t just the big dreams (Bowie wanting to escape the life to have a legitimate marriage) that they have or the brooding nature of the romance (before it became cliché, mind you, as Ray had a great sense of what makes brooding young people tick), it’s in the small, little things, like going to a movie and holding hands in the theater, they know they can’t do because he’s being pursued by the law. It’s in moments like this that make They Live by Night one of my favorite of Ray's early films; he would only expand on these themes in subsequent films, making them more tragic. After seeing and being impressed with They Live by Night, Humphrey Bogart called up Ray to see if he wanted to direct him in his next project (and first for the actor’s Santana production company), the 1949 courtroom noir, Knock on Any Door. The film would be remembered as yet another example of Ray tapping into the disenfranchised youth with lines such as, “live fast, die young, and leave a good-looking corpse,” which, of course, would be a similar credo for a generation that identified with his most popular “teenage outsider” film, Rebel Without a Cause. This isn’t one of Ray’s best efforts (it’s too heavy-handed), but it’s an interesting addition and memorable because of how it acts as a sort of precursor to Rebel as well as further establishing the themes and character types that drew Ray's empathy. After a so-so noir starring Maureen O’Hara (A Woman’s Secret) and a failed attempt to save a sinking-ship of a film (Roseanna McCoy), Ray returned with what is arguably his best film (it’s at least an easy candidate for top three). 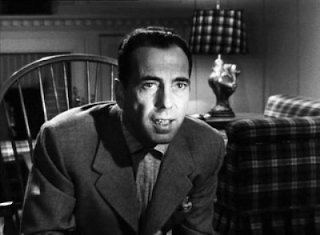 In a Lonely Place is the story of out-of-control, cynical screenwriter Dixon Steele (Bogart, who draws from his own feelings of loneliness to create his greatest performance) and Laurel Gray (Gloria Grahame, Ray’s ex-wife, although people on the set were unaware of their separation) and their doomed love affair that exists in the cruel world of showbiz that would be more popularized in two films released the same year, Sunset Blvd. and All About Eve. Even though those other two films are rightfully hailed and firmly entrenched as two of the best films ever about the entertainment industry, In a Lonely Place more than holds its own. The film has all the trappings of noir, but like They Live by Night, In a Lonely Place is more interested in the love story which is deeply existential. Once again, the audience gets to see one of Ray’s favorite themes at play: Dixon is the troubled soul who often retreats to its dark corners, and Laurel is the woman who thinks she can save him. It won’t be the last time that we see Ray use mismatched characters to showcase doomed love. 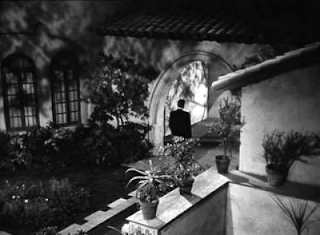 It borders on cliché — the cynical, down-on-his-luck misfit and the good-hearted woman who thinks she can change him — but Bogart’s performance (drawing from his personal life) and Ray’s direction (not to mention the great cinematography from Burnett Guffey who uses the film’s apartment complex location wonderfully to show the isolation and fragmentation of the characters) keeps it from becoming that. The film’s title more than suggests the existential themes Ray loves to explicate in his films, but it also suggests that even the sexiest of places — 1950s Hollywood — can be a lonely place. The film is an interesting precursor to some of the elements Curtis Hanson would eventually use 40-some years later in his masterpiece L.A. Confidential (Hanson had his actors watch this film to prepare for their roles). 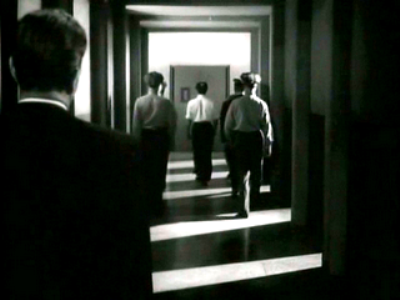 In a Lonely Place is filled with beautiful images (I love that moment on the beach between Dixon and Laurel, or the scene where Dixon is describing the murder from his script to his two leads…and the way Bogart is lit as he goes to that dark place) and some of the trademark moments of isolation that we associate with Ray. Even more interesting is how Ray stayed true to his title of iconoclast by switching the ending at the last second. Displeased with how “neatly” they had wrapped up the story, Ray kicked everyone off set with exception of his two leads and Art Smith. With his urging, he and the actors improvised the ending of the film so that it felt more organic — real to life — which is an attribute of Ray’s films where it is apparent he tried really damn hard to get his vision on the screen. Life, and love, is a damn messy thing for Ray, and he respected the audience enough to show them protagonists who weren’t squeaky clean idealists; rather, they felt like real people doing real things with which the audience could identify. It’s why I lead this piece with that quote; it perfectly describes what it is he’s going for with his films, and I’m not sure he did it any better than In a Lonely Place. As early as 1953, Jacques Rivette identified in Ray a “taste for paroxysm, which imparts something of the feverish and impermanent to the most tranquil of moments.” On Dangerous Ground (1951), a high point of neurosis in film noir, stars Robert Ryan as a cop so tautened by his calling that the simplest act turns savage; in his apartment, he washes and dries his hands as if wringing the neck of an invisible suspect. That is a great quote from Rivette and a great moment described by Denby, and it’s probably the one I would select as my favorite of the film. I think Rivette’s quote works best for Ray’s later films (specifically Johnny Guitar), but it works, too, on this great little noir, especially in the way Ray innovatively used hand-held camera to capture the immediacy of being a cop (he would again use hand-held in The Lusty Men), specifically in the way he films yet another violent protagonist. I can see why Ray had such an influence on Scorsese. Film noir was always an arena for filmmakers to be more experimental — it’s what made the genre so great — and Ray uses some great expressionistic camera movements in the film as well having his characters go to literal dark places rather than existential ones. If Curtis Hanson used In a Lonely Place to educate his actors on the correct tone for when they filmed L.A. Confidential, then On Dangerous Ground is definitely the film he showed Russell Crowe for him to get into his character, Bud, for that film. 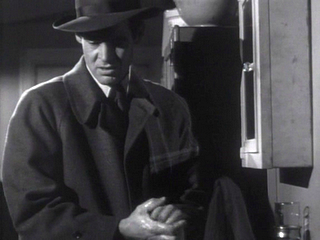 Robert Ryan’s portrayal of Jim Wilson is scary in how quickly he can become unhinged; he has no problems roughing people up in order to get what he wants; however, there’s also something else lurking beneath the rough exterior (as is the case with most Ray protagonists), and in one scene (a really well done, hand-held chase in an alley) Wilson is accosted by his partner for, again, roughing up a suspect. His reply to his partner’s cries for some decorum is simply, “OK, so I get kicked off the force…what kind of a job is this anyway? Garbage, that’s all we handle, garbage!” It’s this mix of unpredictability and surprising introspection from his misunderstood, violent-tempered protagonist that Ray loved to invert about half-way through his films by introducing a love interest. As has been stated already, most of these romances are doomed from the start, but there’s always a speck of idealized romance that exists in these characters (again, you see this influence in L.A. Confidential where Bud is seemingly one-dimensional, but is looking for something beyond his profession, which he's become disillusioned with despite doing it well). Ray gives Wilson a happy ending at the end of On Dangerous Ground as Wilson has his thoughts played out in voice over acting as the catalyst for taking him back to the cabin where Ida Lupino lives. They embrace and kiss, and it actually feels kind of weird for Ray to give his character such an optimistic ending (he would give a similarly toned happy ending to his similarly dark Bigger Than Life). The immediacy and the down-and-dirty tone of On Dangerous Ground is definitely less subtle than In a Lonely Place, but that’s part of its charms; it’s a great noir film and a natural fit for Ray, who again furthers the themes he was drawn to by making a film where his misfit characters (violent and disturbed and outcasts) seem right at home in the world of film noir. It’s one of my favorites. I’ve heard (I can’t remember where, but I’m definitely not taking credit for this) somewhere that Nicholas Ray may have been the first existential action filmmaker. I’m assuming wherever I read and whoever said it was referring to The Lusty Men. A Western/rodeo picture on its exterior, it’s in the quiet, contemplative moments where the film has a headlong energy that we just know — knowing what we know about Ray’s tragic heroes — is going to end tragically. 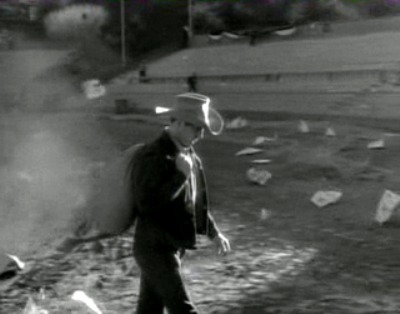 That much talked about, great opening shot of Mitchum’s bull-rider solitarily limping out of the emptied rodeo arena is the quintessential Ray shot: encapsulating in one, brief moment everything that characterizes Ray’s heroes and everything that represents the characters found in The Lusty Men who exist in a fast-paced world that chews them up and spits them out (I love the final shot: despite a man’s death, the show must go on) with little regard for their well-being. Anyone who has seen Ray’s films knows him as the iconoclast that he is; however, when one thinks of such a term to ascribe the auteur, I’m sure their mind does not go towards this small western. Ray, though, loved this film and it shows. It’s one of his most keenly observant psychological profiles, and despite the film’s horrendous title, it’s one of those movies that sneaks up on you with its power. Like most of Ray’s films, The Lusty Men is a narrative with multiple layers. On the surface, the film looks like a movie about the rodeo, when, in reality, The Lusty Men is a film about what it means to go home — both professionally and personally — and make a home, and the complexities that surround such a journey. Ray loved the idea of love triangles, and the pursuit of happiness despite the situations his characters find themselves in — situations that seem to offer no such reprieve from their depressed and banal reality. This motif would pop up again, most famously, in Rebel Without a Cause with the great scene where the trio of characters from that film obtains a glimmer of happiness while playing “house” in an abandon mansion. The film contains the typical Ray love triangle, but it’s also typical of the way Ray infused real life problems into melodrama (much like another of my favorites from the ‘50s — and this would be even more apparent in Bigger Than Life — Douglas Sirk), and he has his characters act as unpredictably and honestly as they would in real life. There’s a great scene where Susan Hayward just has an outstanding moment of acting. It’s toward the end when her husband Wes is fully entrenched in the rodeo circuit. She blames herself for their failing marriage and how she’s no fun anymore (“not like the blonde with the skirt down to her knees” is a line that made me chuckle), but she also is fed up with the role of woman when it’s just the man that gets to do what he wants. Her line, “I’m supposed to sit here waiting for him to come staggering through that door, and then I’m supposed to put my arms around him and make him some black coffee and stick an ice bag on his head and take off his boots and wrap him up warm and put him to bed” is a powerful monologue and a perfect example of how Ray was always looking to throw the customs of the time under a critical microscope. It’s an interesting scene in what is maybe one of Ray’s sneakier message pictures. Obviously there’s dual taming going on here — horses and men — but Ray, ever the one to challenge society's mores, is doing something radical for a film that, on its surface, seems like nothing more than an early ‘50s Western: he’s openly talking about the banality of domesticated life, but he’s speaking from the female perspective. Ray would follow The Lusty Men with the three films that cinephiles everywhere point to as the defining run of his career; three films that would cement Ray's legacy as one of the great auteurs of American cinema. Great piece, Kevin. In a Lonely Place truly is an undervalued film, but I think its number of admirers grows with each passing year. Thanks, Ed. Yeah, I hadn't seen In a Lonely Place in a long time, and I would say along with seeing The Lusty Men for the first time, it was the most pleasant experience while (re)visiting his films for this piece. I do think it's one of Bogie's best performances.